His Excellency the President of Umm Al-Qura University, Prof. Abdullah bin Omar Bafail, declared that the project of developing and upgrading human resources reached its final stages. 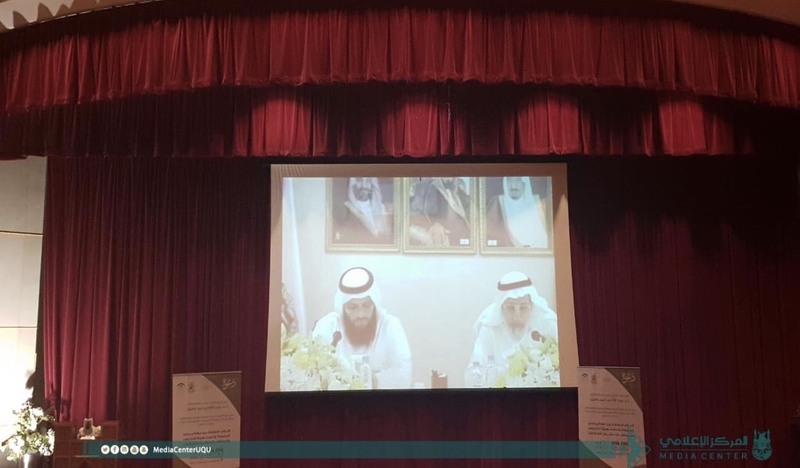 The Deanship of Faculty Members and Employees Affairs is responsible for its strategic plans to upgrade the educational and research outcomes in a way that is in line with the program of the Custodian of the Two Holy Mosques, King Salman bin Abdulaziz Al Saud, for developing human resources with regard to training and qualifications. This statement was during the meeting which was organized by the Vice Presidency for Female Student Affairs, in collaboration with the Deanship of Faculty Members and Employees Affairs, for His Excellency the President of the University with the female academic staff and employees through Al-Jawhara Hall’s CCTV in the female students' campus in Al-Zahir. The meeting was attended by the Vice President for Female Student Affairs, Dr. Sarah bint Omar Al-Khuli; the Dean of the Faculty Members and Employees Affairs, Dr. Farid Al-Ghamdi; the Dean of University Studies, Dr. Hala bint Sa`id Al-Amoudi; the Vice Dean of the Faculty Members and Employees Affairs, Dr. Khuloud Abul-Naja; the General Supervisor of the Facilities and Services Department, Eng. Abdullah Al-Jifri; and a number of the vice deans of branches, deanships and colleges. His Excellency the President of Umm Al-Qura University stressed to the female academic staff that their requests are regarded with great attention, and promised to discuss them with the Advisory Panel Council of the University to find suitable solutions. He also stressed that women enjoy an outstanding status in the vision of 2030, which necessitates the development of women's talents, making use of their abilities and enabling them to have suitable chances to build their future. His Excellency said, in response to a question posed by the female academic staff, "There is a committee composed of males and females to nominate efficient persons for leading posts in the departments and vice deanships, and to give cooperative non-faculty members their financial dues during the current financial year." He gave them glad tidings of great advancement in the educational technologies and environment for the current semester. He pointed out that he is seeking to find appropriate job descriptions for academic staff members. His Excellency asked the Deanship of Faculty Members and Employees Affairs to form a committee for administrative promotions that include male and female members, and to create an electronic platform to compare between competitors and another one to conduct comparisons between academic and administrative jobs. He also stressed the principle of equality among employees with regard to training courses offered by the General Administration Institute, to achieve justice and transparency. He added, "All academic promotion applications, from the posts of assistant teaching to lecturer, should be accepted and placed on the waiting lists, to achieve equality for all." He pointed out that the services of admission and registration are being developed, saying, "We seek to provide an outstanding service in order for the students to access, through it, their academic services on their own, through the e-portal."